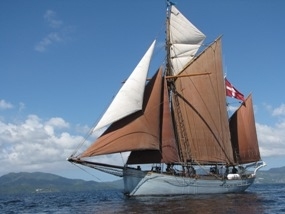 The 'Yukon' is an historic 17 metre Danish fishing ketch. This classic boat has a great story which can be seen here as well as in an article in Wooden Boat. Yukon will be ready to sail charter in Tasmanian coastal waters from the 1st of February 2013. Yukon’s first charter was taking part in the Tawe Nunnugeh 2013 as flagship.